This volume is the proceedings of IAU Symposium No. 118 on "Instrumentation. 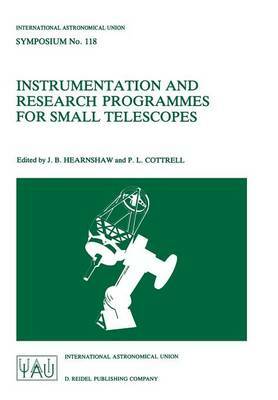 and Research Programmes for Small Telescopes", where small telescopes were defined as those ground-based instruments with apertures less than 1.5m. The scientific goal of the symposium was to emphasise research programmes which were more suited to smaller tele- scopes, on which frequent regular observations can be made. A wide variety of topics on instrumentation, photometry, spectroscopy and polarimetry of objects in the solar system to extragalactic systems were discussed. Each of the four scientific days of the symposium comprised a number of invited review papers, contributed oral papers and discussion sessions devoted purely to the large number (~4) of poster papers. An introductory paper on the research potential of small telescopes sets the scene for the symposium. The proceedings have then been divided into three sections. Section I: Telescopes and instrumentation; Section II: Photometric research programmes; Section III: Spectroscopic research programmes. The diversity of topics within each of these sections indicated the extent to which small telescopes have (and can) contribute greatly to astronomical research. Dr J.A. Graham's summary of the symposium, which illustrates the opportunities available with small telescopes, concludes these proceedings. As in all symposia, the importance of the discussion following each paper was realised. The discussion was recorded on tape (and wherever possible on questions and answer sheets), transcribed and then edited.